Remember: For every wrongly dismissed genius there are a million rightly dismissed idiots that think they’re geniuses. That reminds me of the famous quote from Carl Sagan: "The fact that some geniuses were laughed at does not imply that all who are laughed at are geniuses. They laughed at Columbus, they laughed at Fulton, they laughed at the Wright brothers. But they also laughed at Bozo the Clown." Bozo the Clown was a better man than Columbus. According to popular advice, it's the thought that counts. "It's an incredible con job when you think about it, to believe something now in exchange for something after death. Even corporations with their reward systems don't try to make it posthumous." "Millions long for immortality who don't know what to do on a Sunday afternoon." "Organized religion: The world's largest pyramid scheme." Especially the ancient Egyptian religion. It's only called a Neural Network if it comes from the Neuralè region of France. Otherwise you have to call it a logistic regression. I'm going to live the rest of my life by those words. 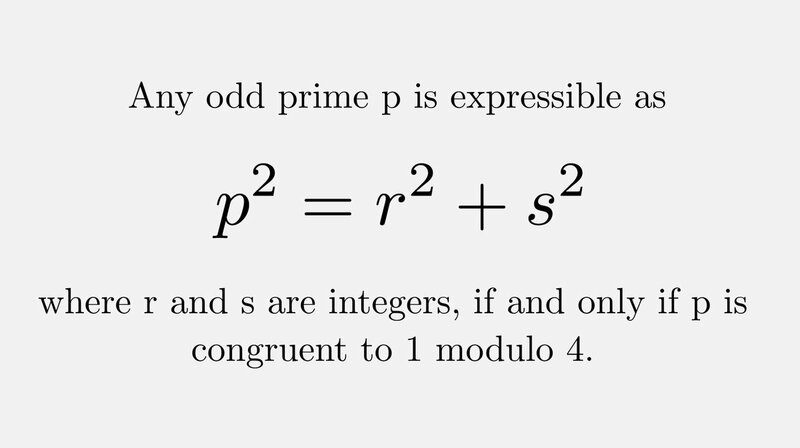 They start out saying "Any odd prime" and then later say, wait, no, it only applies to certain odd primes. There are only two kinds of odd prime numbers, those that are "congruent to 1 modulo 4", and those that are "congruent to 3 modulo 4". Abdul will appreciate the use of the word "modulo" and ed will be confused by it. There are no even prime numbers that are "congruent to 1 modulo 4", therefore the theorem is true for any prime number, not just odd prime numbers. Mathematicians sometimes have a funny way of expressing theorems. For the non-mathematician, the phrase "congruent to 1 modulo 4" means if you divide a number by 4 the remainder is 1. Example: 13 divided by 4 has a remainder of 1. For any whole number, if you divide it by 4, the remainder will be either 0, 1, 2, or 3. Those are the only possibilities. There is only one prime number that is "congruent to 2 modulo 4", and that is 2. That is to say, 2 divided by 4 has a remainder of 2. There are no prime numbers that are "congruent to 0 modulo 4". That is to say, there are no prime numbers that are divisible by 4 with no remainder. The phrase "congruent to 1 modulo 4" also implies there exists a number x such that p = 4x + 1. This should be obvious because if you divide 4 into (4x +1) then you get a remainder of 1. Shemp has absolutely no choice but to live the rest of his life by those words, irregardless what he might want to do instead. It is not necessary to square the p. In fact it is redundant to do so, since if p is equal to the sum of two squares, then so is p2. 1. One brand of butter had a coupon, but none of that brand was in the dairy cooler. So I looked around and saw one clerk in the ethnic aisle stocking shelves, and I saw another guy putting milk in the milk section. I knew to approach the milk guy, even though he was farther away. When i asked about the butter, he said, "We are subbing Fred Meyer". Even though I had never heard a sentence like that before, I understood he meant they were allowing customers to substitute the Fred Meyer brand of butter for the coupon for the other brand. 2. Why is Sean Bean pronounced "Shawn Bean" and not "Shawn Bawn" or "Sheen Bean" or "Seen Bean", and how do I know that?